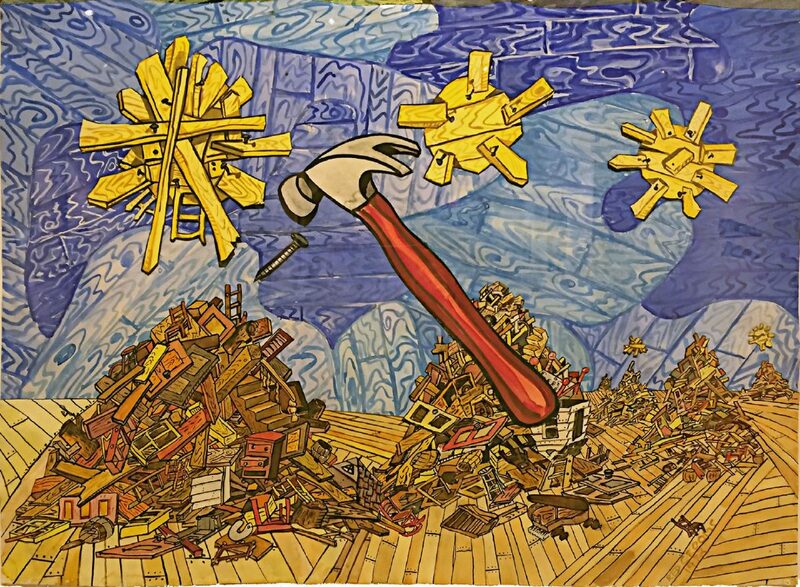 "I Nailed Wooden Suns to Wooden Skies" by Red Grooms. This is a terrific exhibition! “ReTooled,” displayed in the Clark Gallery at the International Museum of Arts & Science, or IMAS, is a delightfully serious foray into the impressive collection of hardware-industry pioneer John Hechinger. 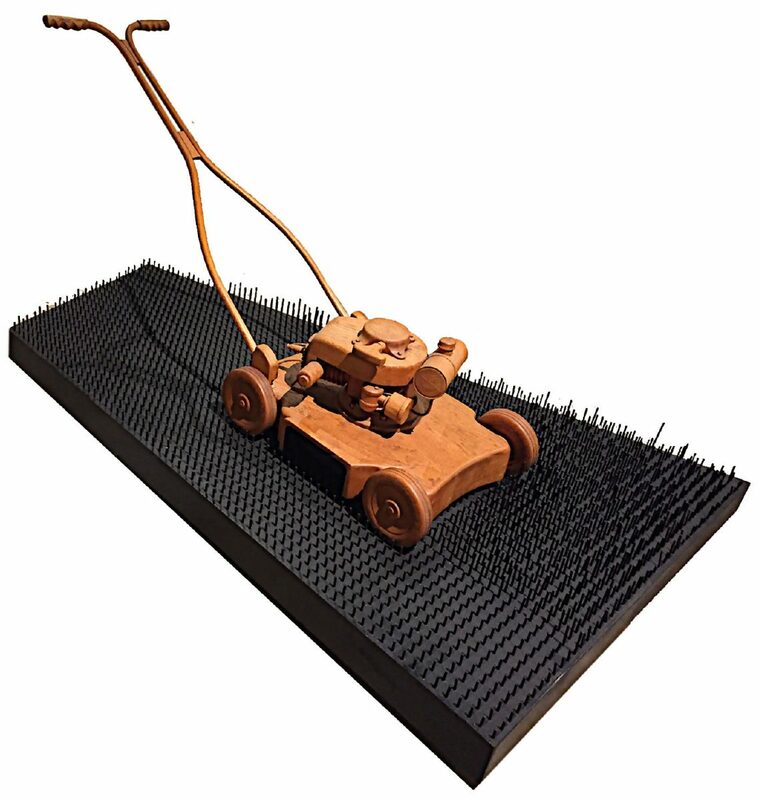 Consisting of works by 28 artists, “ReTooled” celebrates the common tools in our everyday lives by transforming their images into works of beauty, wit and insight. The exhibit is organized into four sections — Objects of Beauty, Material Illusions, Instruments of Satire, and Tools: An Expression of Self. Viewers may view the entire exhibition from any one of these levels, or, for maximum insight, consider several categories per work. 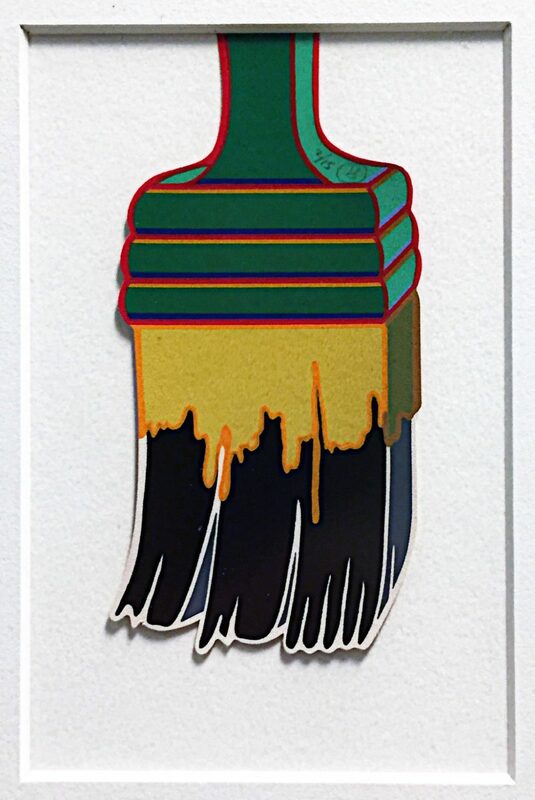 Based in Washington D.C., Hechinger collected these works for display in the corporate offices of his booming hardware store business. His artistic interest was tool-inspired 20th century art. Wanting artworks that were accessible and engaging to all audiences, his collection is diverse in its range of ideas, materials and forms. The selections in “ReTooled” reflect his goal — it would be difficult for anyone not to enjoy this show. Hechinger’s first acquisition for the collection was the “Tool Box” series by Jim Dine. Inspired by his own family’s hardware store, Dine fashioned a series of prints featuring different tools in dynamic situations, and presented editions in a red, lacquered, “Tool Box;” the entire edition is displayed. After that, the collection moved quickly ahead. 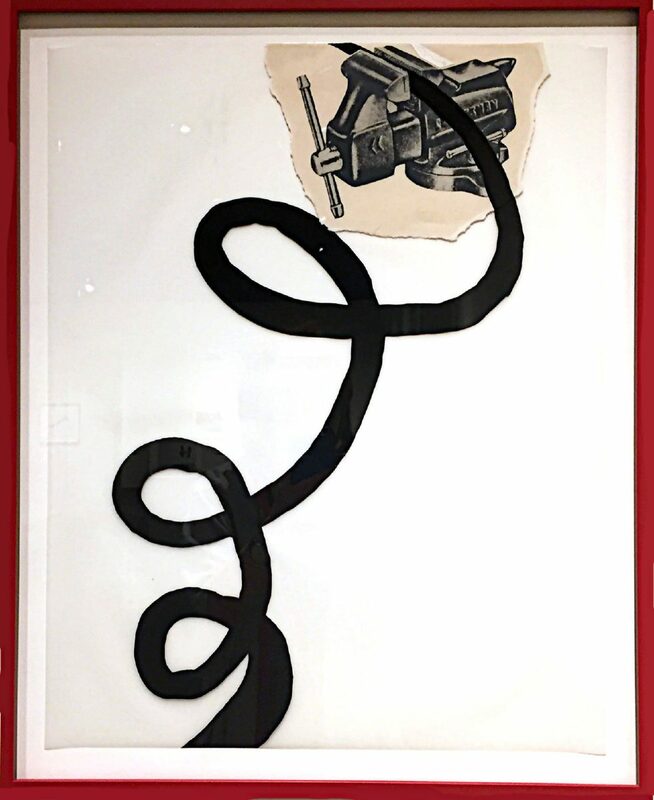 "From the Tool Box series" by Jim Dine Silkscreen. 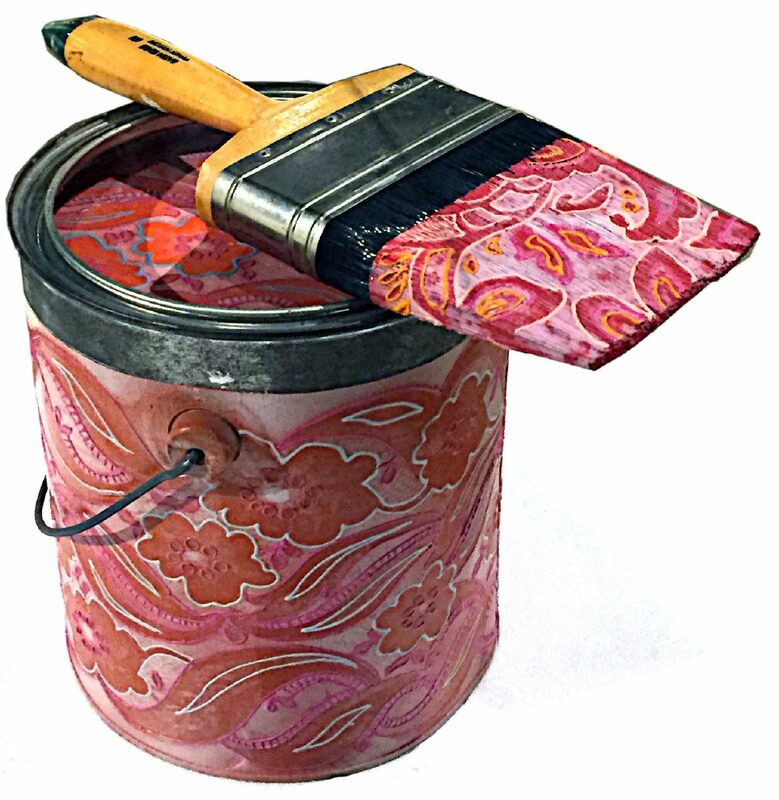 "Paint Can with Brush" by Phyllis Yes. "Summer Tool" by F.L. Wall. I particularly enjoyed the watercolor by Red Grooms. His work, “I Nailed Wooden Suns to Wooden Skies,” is a dark fantasy about man’s reckless reconstruction of the natural world and the damaged quality that ensues. Its whimsical style belies its message. Stephen Hansen’s “Man on a Limb” is humorous yet carries an implied warning about the importance of understanding the consequences of careless tool use. This life-size papier måché piece is installed overhead, underlining the feeling of impending doom. Some of the artists represent tools through a sense of respect and purity for the design of the object, as in Berenice Abbott’s photograph, “Spinning Wrenches”. “ReTooled” is an impressive collection; most of the artists are stellar names in the art field, and the works in this show are not just asides to their work of art, but key expressions. Collections are typically formed by artist or style, unlike Hechinger’s. This collector not only had an important relationship to the subject matter in these works, but a knowledgeable acquaintance with the art field. This collection is the expression of Hechinger, and as we view each work we have a sense of connection with him. The Rio Grande Valley community is fortunate in having the opportunity to see original works by these artists; it is definitely a must-see exhibition for everyone.